One day after President Trump suggested that Puerto Rico's huge debt load could be wiped out, his own budget director walked the comments back. 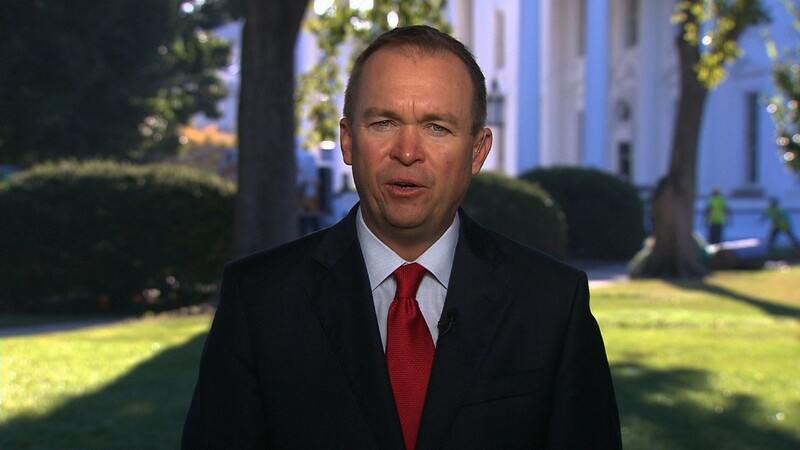 "I wouldn't take it word for word with that," Mick Mulvaney, the director of the Office of Management and Budget, told CNN's "New Day" on Wednesday. The U.S. territory has struggled with a financial crisis for years -- since long before Hurricane Maria devastated the island two weeks ago. A $73 billion debt burden forced Puerto Rico in May to file for the biggest U.S. municipal bankruptcy in history. On Tuesday, Trump told Fox News' Geraldo Rivera that "we are going to work something out" on Puerto Rico's debt. "They owe a lot of money to your friends on Wall Street," the president said in San Juan. "We will have to wipe that out." It wasn't clear what Trump had in mind, including whether he was suggesting a government bailout or a restructuring of the island's debt that would impose losses on investors. On Wednesday, Mulvaney said the burden lies with Puerto Rico. "This was a very badly mismanaged island for a very long time," he said. "And I think what you saw the president talking about was his acknowledgment that Puerto Rico is going to have to figure out a way to solve that debt problem in order to fix itself going forward." As for how: Mulvaney mentioned a law called PROMESA, Spanish for "promise," that Congress passed last year to address Puerto Rico's debt. The law created a financial oversight board to help the island, and it staved off creditor lawsuits for a few months. A messy legal battle followed anyway. Puerto Rico filed for bankruptcy as PROMESA's lawsuit protection provision ran out earlier this year. "Those bonds are being dealt with, were being dealt with before the storm, will be dealt with after the storm through the PROMESA process," Mulvaney said. "Our focus will be entirely on rebuilding the island, making sure people are safe, and that Puerto Rico can get back on its feet." --CNNMoney's Jethro Mullen and Matt Egan contributed to this story.